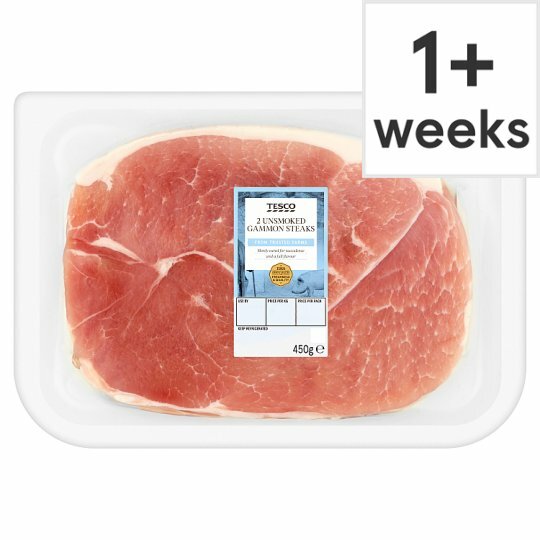 Unsmoked gammon steaks, formed from selected cuts of cured pork leg meat with added water. Pork (87%), Water, Salt, Preservatives (Sodium Nitrite, Potassium Nitrate). Hints & Tips:To help with even cooking the gammon steak can be cut with scissors around the fat edge of the steak. This will allow for the steak to flatten out in the cooking process.Why not add a slice of pineapple to the steak, allow to cook & caramelise under the grill or in the pan. Cook the steak and on turning add the pineapple slice & cook with the steak for the remaining cooking time.